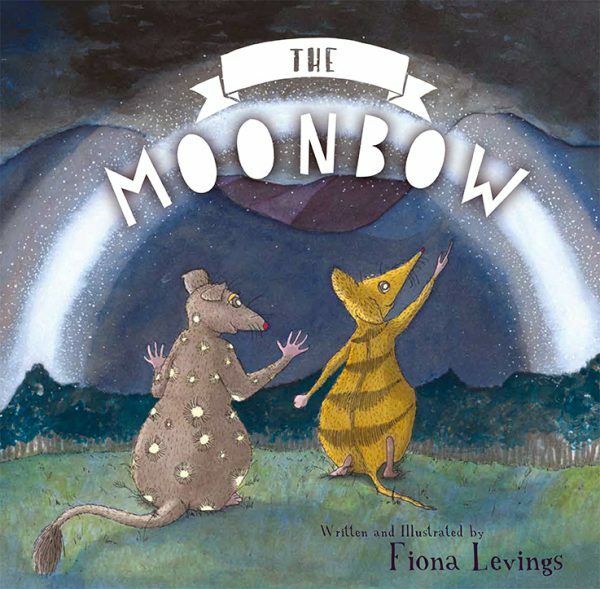 Tasmanian writer Fiona Levings has recently launched her debut picture book for children, The Moonbow. The book is a beautiful, heartwarming story, wonderfully illustrated by Fiona, and it is one of our Recommended Reads for January. If you check out that post you’ll see that we have a copy to giveaway! We are very grateful to Fiona for taking some time to answer a few questions for us, and for allowing us to share some of her illustrations. You can read more about The Moonbow on a dedicated website and also watch out for related news on The Moonbow Facebook page. Congratulations on the publication of The Moonbow, Fiona! How have things been going since your launch? Thankyou! It’s been going well, I think! I’ve had some lovely feedback from people and a few photos of little people clutching it close, which is wonderful. Can you tell us a little bit about The Moonbow and how you came to write it? The Moonbow came about as a result of going out for a walk one evening a couple of years ago. I am very lucky that our house sits at the base of the Snug Tiers and we have some lovely bush areas to explore. I was a full-time Mum, home with a two-year-old all day, and an evening walk provided a bit of an escape. That night I headed uphill and when I got to the top, there was a moonbow. It was really large and white and I’d never seen anything like it before. It looked like the ghost of a rainbow. There was a full moon behind me and rain on the hills in front so, logically, I knew this must be a rainbow of moonlight but I still don’t think I really believed that until I got home and Googled it. It was such an amazing, unexpected thing to see. I’d been reading a lot of children’s books at the time (actually, I still am) and I think everything just sort of combined because the story, the wording of the rhyme and the characters of Myrtlewump and Mutterbee just kind of … solidified … out of my mind very quickly after that. What was the most fun or interesting (or difficult!) thing about doing an illustrated book for children? I loved the illustration process. That was a lot of fun to do and such fun to share. Sharing the book is the best thing really; you do spend a lot of time sitting around on your own creating it. After all that effort it’s such a kick to see other people read it and smile. Do you run your ideas and illustrations past your son before letting them loose on the world? Oh yes. If you look closely, on many pages in The Moonbow you will see lots of little eyes peering out from gaps and cracks. Jem loves the eyes! Can you tell us a bit about where and how you work? I work from home, mainly while the small person is at school although I did need to pull evenings and weekends in order to get the book done. I am fortunate to have a working space separate to the house which, although initially an office, has adapted well to a new role as studio. Do you find Tasmania is a good place to be a writer – do you find the landscape inspiring? Absolutely. The landscape here, the atmosphere, the coast, the water, is so unique and so beautiful. It’s such a complex and wonderful thing that operates on so many scales from tiny individual bits, pebbles or bugs or leaves right up to the landscape scale of mountains, cliffs and islands. A desire to capture even a just a tiny bit of this was why I decided to illustrate The Moonbow myself; in my mind it is a story that is very bound to a particular place and I really wanted the book to reflect that. What about your background as a geologist? Are there elements of that science background that you include in your work? Definitely; I had to draw the rocks right! The study of natural sciences involves a lot of time learning to observe and one of its key tools is drawing. Drawing really helps you to look at a thing and see what it actually is as opposed to what you may (unintentionally) assume it to be. I think my drawing style is very influenced by that; I tend to add details. Moving past that and perhaps experimenting with a freer style is one of my goals. Who or what do you think is important to provide support and a sense of community for writers? Is the children’s illustrators community a close and supportive one? 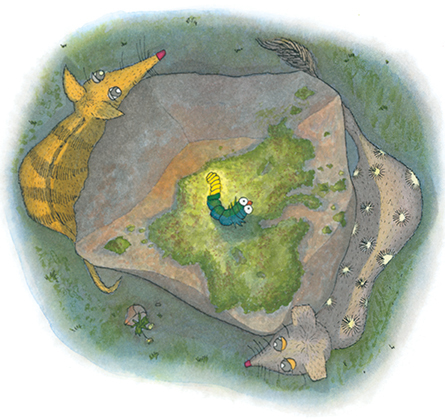 I’m fortunate to be part of a group here in Hobart called CWILLs (Children’s Writers and Illustrators) which I found thanks to the Tasmanian Writer’s Centre. It’s fairly informal, we catch up for coffee once a month but it provides a really important opportunity to meet and talk and have that interchange of ideas and experience with other creative people. It’s a simple thing but very important when you spend so much time on your own staring at a page. Through CWILLs I have also been fortunate enough to attend some local SCBWI events which are lots of fun and usually really informative. We’ve been having a nosey at your blog and admiring all the beautiful work you’ve been doing for the online course with LAC. Do you feel as an illustrator that there’s always more to learn? Glad you like it! Yes, there are always new things to try and learn. It’s easy to get fixed into a particular style and medium, especially if you feel that it’s working for you. When the pressure is on to produce something it can be hard to be brave and try something new! So many! I love Oliver Jeffers’ children books, Julie Vivas’ illustrations, classics like Eric Carle and Dr Seuss … there are so many others though, books that we’ll read from the library together and you just think, wow, this is so well done, these illustrations are just so good! Are you able to share any secrets about what projects are next for you? I think my next painting project is going to be my house! I do have lots of ideas, there’s at least one sequel to The Moonbow that may see the light of day at some point, plus a few other projects close to my heart. I don’t intend to stop illustrating anytime soon but exactly what the future looks like, I’m not sure yet. Little Steps (publisher of The Moonbow) have asked me to go on their database as a freelance illustrator so, who knows, maybe I will wind up working on something completely unexpected!